Malt culms are the dried shoots and rootlets of sprouted grain in the brewing process. The fibres of malt culms, being highly digestible, are a useful feed. Their value is greater for ruminants than for monogastric animals because only about half of the crude protein is digestible true protein. The quality of malt culms is variable; only those in good condition, free from mould and off-flavours, should be used. Malt culms are bitter and are sometimes refused if fed alone. As dried malt culms swell in the stomach, the amount fed daily should be limited to 1.5 kg for cattle. They can affect the taste of milk if large amounts are given to dairy cattle. It has been used in the rations of growing-finishing pigs up to a level of 16% of the total diet with good results. Barley rootlets or sprouts are considered as classical ingredients in the constitution of commercial or experimental rabbit diets in Europe, as source of proteins (21-25% DM) and digestible fibre ( Garcia et al,., 1996; Chrenkova et al., 2012). The most frequent level of inclusion is 3 to 5% in the complete diets for growing rabbits as for reproducing does (de Blas et al., 1995; Nicodemus et al., 2002; Rebollar et al., 2011). One of the side interest of the presence of barley rootlets in pelleted diets is the improvement of pellets quality (durability) with an efficiency similar to that of beet pulp (Israelsen et al. 1981, cited by Kaliyan , 2009). In the studies on the possibilities for higher incorporations levels , barley rootlets were introduced up to 30% in complete growing rabbit diets without any inconvenient for growth rate, health of rabbits or meat quality (Bagliacca et al., 1987; El-Gendry et al., 2000). The slight alteration of performances with 45% barley rootlets in the diet should be attributed more to the imbalance of the diet than to a specific toxicity problem. Effectively proteins of the barley rootlets are deficient in lysine (85-88% of requirement) and their introduction at high level in order to reduce the incorporation level of soybean meal, induces a lysine deficiency increasing with the incorporation level. Nevertheless, barley rootlets should not be introduced without precaution because if the high risk of presence of mycotoxins in some commercial samples of this product, particularly fumonisin and ochratoxin A (Rosa et al., 2008; Cavaglieri et al., 2009) . These 2 mycotoxins were clearly identified as source of teratogenic, nephrotoxic and hepatotoxic problems in the rabbit (Mezes et al., 2009). More positively it should be noticed that the addition of barley rootlets in rabbit diets reduced the plasma cholesterol (El-Husseiny et al., 1997) and consequently that of rabbit meat. 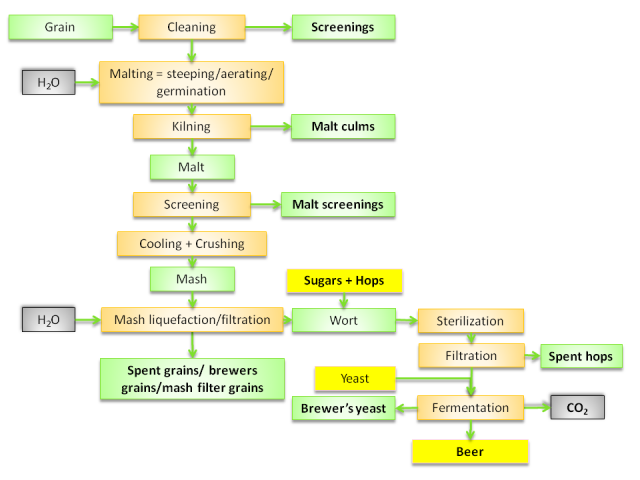 The relatively recent production of "beer" based on malted sorghum instead of malted barley in different countries such Nigeria, makes by-products of sorghum malt production available for animal feeding. The malted sorghum sprout ( MSP) commercialised corresponds a mix of dried roots and shoots (Jegede et al., 2006). In a study with growing rabbit malted sorghum sprout was introduced up to 30% of the diet. Best results of growth rate were obtained with 20% of MSP , close to those obtained for the control diets, and feed conversion ratio was improved : 3.30 vs 3.43 for the control (Jegede et al., 2006). In a second similar study, the same research staff (Jegede et al., 2008) had again observed a slight but significant reduction of the growth rate with the incorporation of malt sorghum sprout up to 30%. But as in the first study, the incorporation of MSP was associated with a marked reduction of soybean meal and wheat offal without corrections for the diet's amino acids content, then creating a simultaneous lysine and sulphur amino acids deficiency, because of the low content of MSP in these 2 essential amino acids (Aning et al., 1998). The consequence of this amino acids imbalance is amplified in the case of MSP introduction because this by-product may contain appreciable levels of residual cyanogenic compounds (Panasiuk et al., 1984), and it is known that their detoxification needs appreciable extra quantities of lysine and methionine (Oziba et al., 1994). The amount fed daily should be limited to 2.5 kg for horses.